Warner Bros. A Tribute to the Original "Love God"
They were just like people to me, these wonderful and zany critters n' characters that comprised the 1960's cartoon brigade. Academy Awards are offered up annually to the best performers, but yet, these loveable, highly unforgettable, and completely influential folks don't even get a nod? No way. These folks provided us with constant, non-stop entertainment on a daily, nightly, and weekly basis. How much more of a performance did we need?! Not only that, but whenever we went to the drive-in, or the movie theaters, who entertained us first? Cartoons! So, this is my dedication to the greatest friends that I can remember from those glorious days of the 60's. 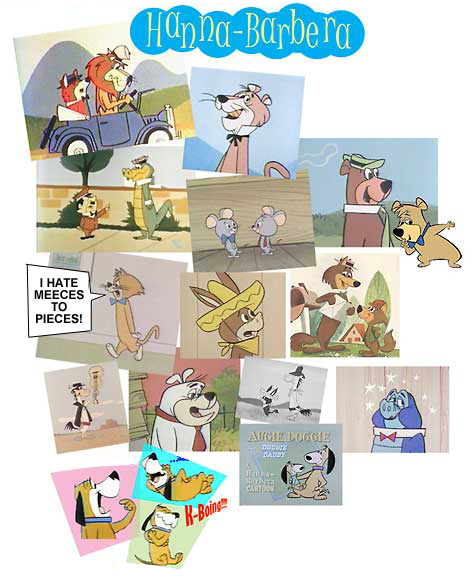 One of the things I loved most about Hannah-Barbera cartoons were the "human" qualities the characters had. They sounded more like people, and acted the same. jinx the catThe artwork and animations were also in keeping with the times whereas Disney and Warner Bros. had a sort of timeless quality. Their backgrounds were standard, more like paintings. But HB, they were classic. Watching a Hannah-Barbera cartoon these days, one can see a definite retro-style design in the animation, the backgrounds, and the coloring. I also really love the simplicity of design in the characters. They're not as detailed as Disney or Warner's. The lines are sleek, and the characters follow suit. HB cartoons came on every night to entertain us. They had great theme songs, wonderful dialogues, and a cavalcade of characters! We'll Have a Yabba-Doo Time! 1960 was the year the stone age family came to our television sets. I was a Flinstones Junkie, and tuned in faithfully. Even as an adult watching them in syndication, I couldn't help but get a strong sense of familiarity, something about them reminded me so much of somebody else.flinstones As I later learned, The Flinstones were cartoon knock-offs of "The Honeymooners", another of my favorite shows. Does anybody remember Fred's "twinkle-toes" bowling? 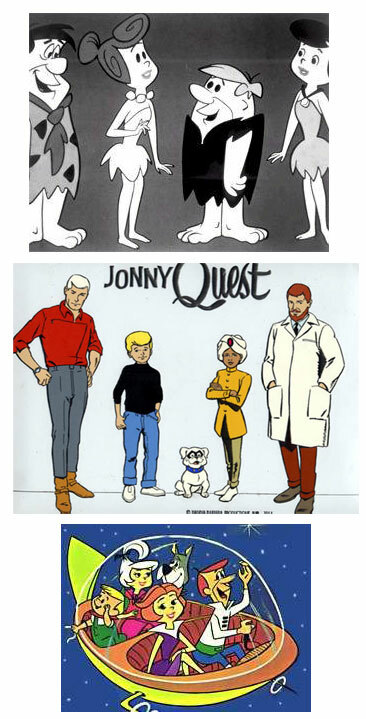 Some of Hannah-Barbera's other greats included "The Jetsons" and "Jonny Quest". I also really loved "El Kabong", and "Quick Draw McGraw" and his goofy hyena sidekick named "Baba Louie" who always spoke in a heavy Spanish accent and called him "Queeeks Draw." Warner Brothers Cartoons, fueled by the vocal militia of the great Mel Blanc and set to life by an army of highly gifted animators, provided me with a whole new world of cartoons. These characters seemed like the elite, the polished, the budgeted versions of Disney even though most of the time they seemed far superior. Unlike Hannah-Barbera , Warner Brothers cartoons were more "adult-like", more scheming, and more in tune to the real world. Their antics at times were far from innocent, even though they played out harmlessly on the TV screen. Porky Pig being a flesh-colored character sans-pants, was actually banned from television for a period since he appeared to be naked. Crazy, huh? Especially since most of the other characters were all minus clothes. Their only saving grace was the fact that they, for the most part, weren't flesh colored. The b-b-b-b-b-b-b-bottom line is: censors were worried about all the wrong things. I think that much of the charisma of the 60's cartoons was not just in the characterizations, but the writing as well. The scripts seemed edgy, focusing on one character outsmarting another. Critters with real-world agendas entertained us on the highest levels possible. Take for example how hilarious it was fun to see Yosemite Sam try to blow up Bugs Bunny with dynamite. It was hilarious to see how many ways Sylvester tried to get at Tweety. Daffy Duck was a grand manipulator, sometimes getting the best of Bugs Bunny, who was indeed the master manipulator of all. Then there were all the loveable characters: Foghorn Leghorn, the barrel-chested blowhard, ("I say boy, I say hey boy, ya' gotta learn to stand on your own two feet boy, I ain't always gonna be around to pick ya up son!") sounded off like a drill sergeant, and Speedy Gonzales, the world's fastest mouse, had a trademark accent that could have been reincarnated into the Taco Bell dog. Daffy Duck was one of my favorites, but my all-time favorite WB character was and is Sylvester the Cat. I especially loved the ones with his son, the little Sylvester. "Now lithen, thon..."
American stupidity reached its apex when it was decided that these "older" cartoons were far too violent for children to watch. Instead, we now give our kids these horribly violent video games, movies of equal measure, rap music which encourages social decline, and cell phones and computers so that they may live as a separate society. It's a good thing we kept 'em away from those nasty "old" cartoons though. What would the world have come to if children could have been influenced by Daffy or Bugs? "Ah yes, eet ees love!" 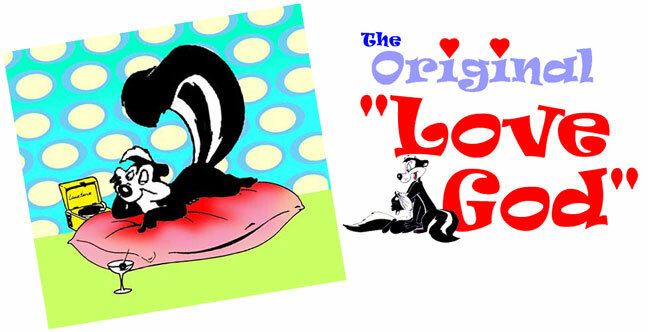 Undoubtedly, Pepe Le Pew was the world's greatest lover. The greatest film stars of the era, past and present, offer very little in the way of competition for this loveable skunk with the thick french accent. He certainly won me over, and I offer him a special portion of this web page in thanks. One of the things that I really loved about Warner Brother's cartoons-aside from the perfect "Looney Tunes" theme song, was the fact that they featured some characters modelled after popular actors and actresses of the time. In the case of Pepe, you will see and hear a strong resemblance to the french actor Charles Boyer . Boyer, who was often a romantic lead, was one of the screen's original foreign charmers whose work I've always enjoyed. Charles now lives forever in the form of a precocious skunk with an eye for "zee ladies, no?" Pepe Le Pew is one of my favorites. His legacy will live forever alongside his black and white and furry lookalike Sylvester the Cat. Watch Pepe LePew in: "Louvre Come Back to Me"
List for the www.activeinstafollowers.com just buy US linkedin connections to visit.